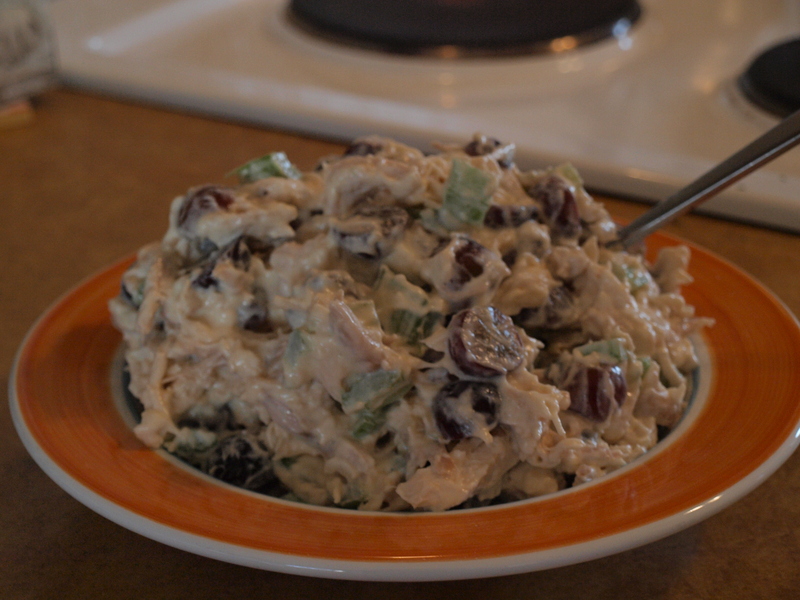 Cool & refreshing on a warm spring or summer day, homemade Chicken Salad is just hard to beat! 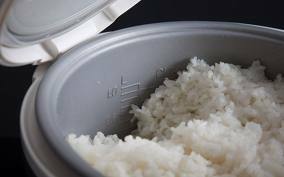 We are continuing our series on Comfort Foods that are also Freezer Friendly, but are going to break away today from that for this post. For those of you that have just discovered our blog, right now we are journaling through a day that we spent filling the freezer for our daughter-in-law, Cassie while she is recovering from some health issues. Our recipe today steps away from the freezer meals, because they were also in need of something that was just ready to grab out of the fridge for an easy to fix lunch. 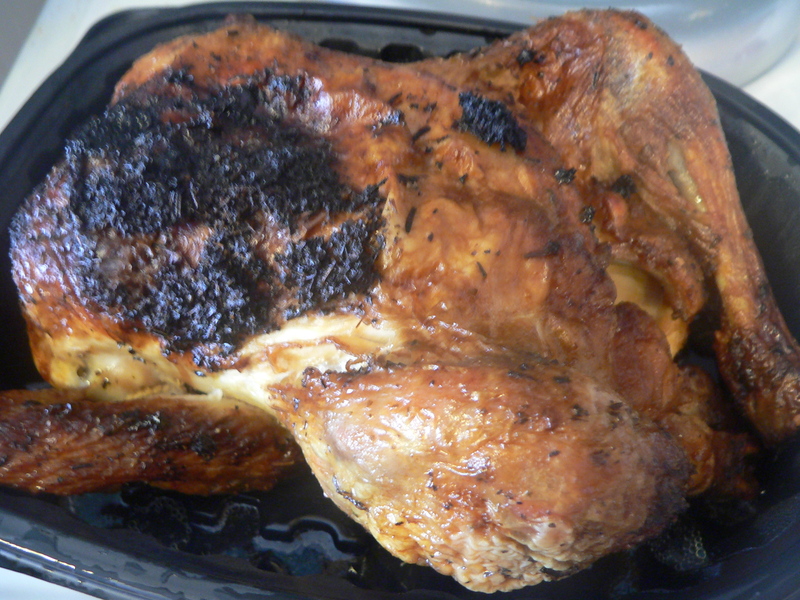 We started with a nice Rotisserie Chicken from the Deli. Skin & de-bone the cooled chicken, then tear or cut into bite sized pieces. We used one whole chicken. 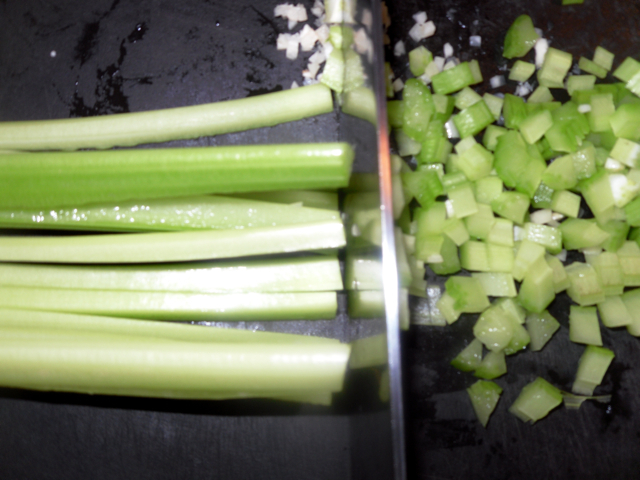 Dice the celery…this gives the chicken salad some great texture and CRUNCH! This recipe comes from an experience our daughter, Jenny had while working at a great little diner one summer during college. 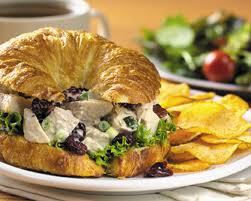 It is a light and delicious Chicken Salad that is refreshing served on a nice hearty bread, a light croissant, or on a lettuce leaf as a salad. We go for the REAL mayonnaise...Hellmanns! 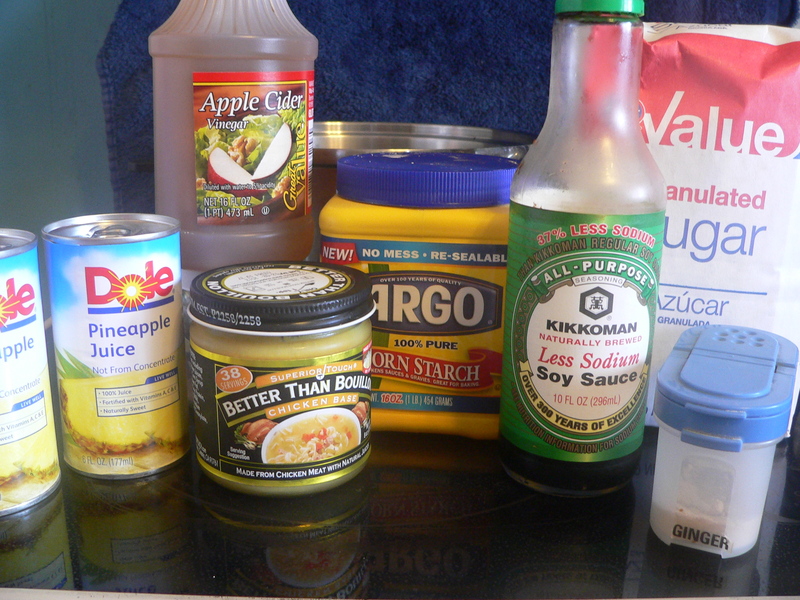 Mix up the sauce that holds it all together using Real mayonnaise, sugar, salt & pepper. It’s starting to look like Chicken Salad! Serve on a hearty wheat berry bread, a light croissant, or on a lettuce leaf. Refreshing and delicious! 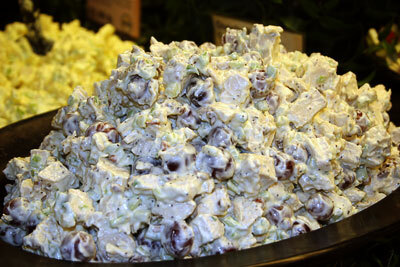 Any church potluck will confirm the fact that there are hundreds of great Chicken Salad recipes out there that are family favorites! We hope you enjoy this very simple one. Click here for easy print recipe. Mix all ingredients together. Add a little more mayonnaise if needed. Chill thoroughly if you can wait! 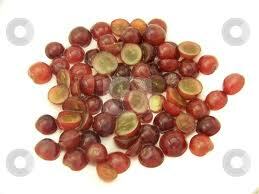 Delicious served on a fresh croissant, hearty wheat bread, or beautifully arranged on a lettuce leaf. This is such a simple recipe, but delicious! 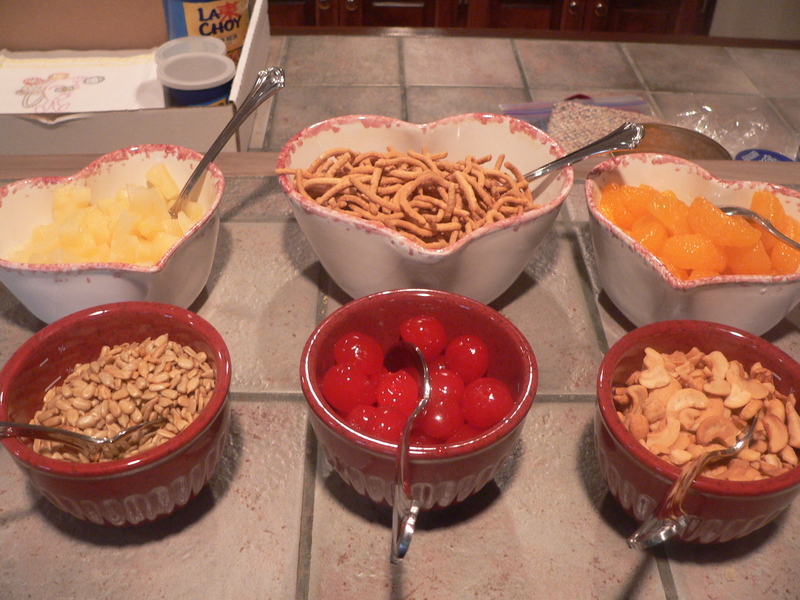 An option would be to add some slivered almonds or chopped pecans, but my family likes it better without the nuts. 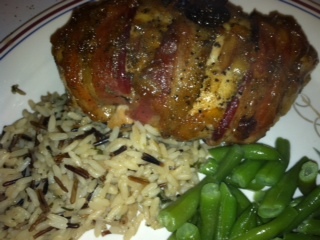 Pretty enough to serve at a ladies luncheon, and hearty enough that the guys even like it! …Continuing our little mini-series of Comfort Foods that are also very FREEZER FRIENDLY… and feel like this is same song, second verse…this is another favorite recipe that I have had for over 30 years. A little gal, Melody Connor was in our “Newly Married” Sunday School class and served it to us for dinner at their house. Of course, even back then, I was never shy about asking for a good recipe when I taste something delicious! Start by gathering up the ingredients…looks like a big mess here… 🙂 We were making about 8 recipes at the same time! I just love it when we’ve got a hundred things going! Living out in the country if you forget an ingredient, you just have to start substituting. Sometimes, it turns out to be a whole other dish! 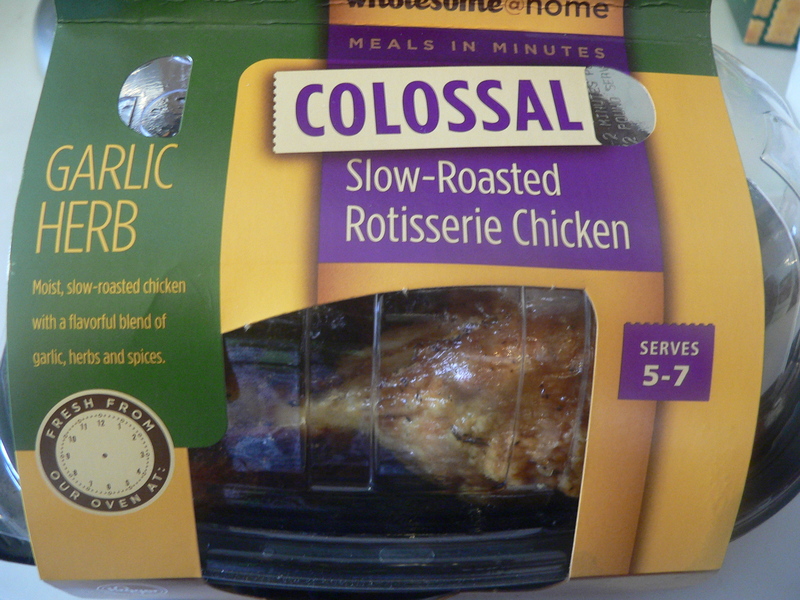 We started out with a rotisserie chicken, but you can use any cooked style chicken that you like. This chicken was relatively small, so we used the whole chicken. Just remove the skin, debone and tear into bite sized pieces. Mix chicken with green chilies, sour cream & cumin. 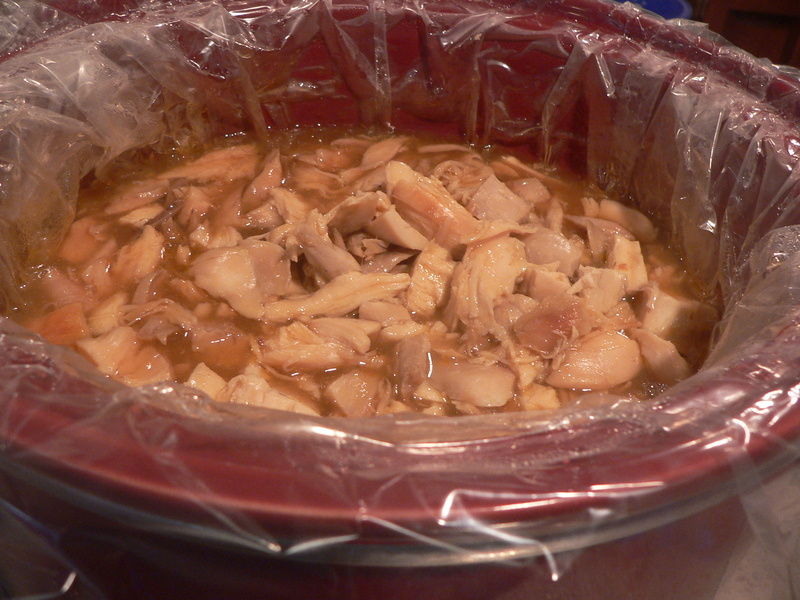 Place about 1/4-1/3 cup of chicken mixture on each of the tortillas and roll up. 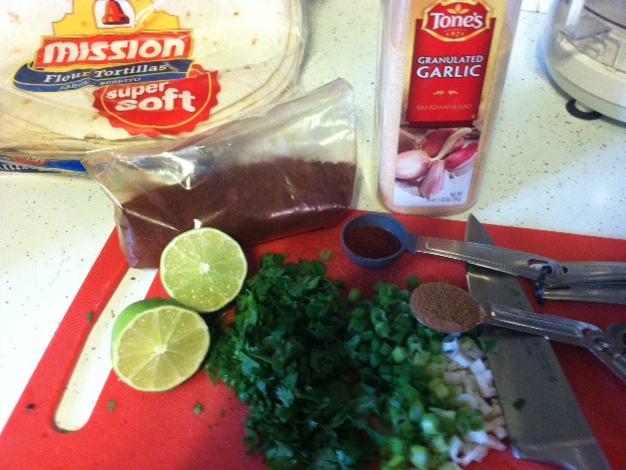 Mix up sauce and pour over the top of the rolled tortillas. Top with some shredded (sharp) cheddar cheese. 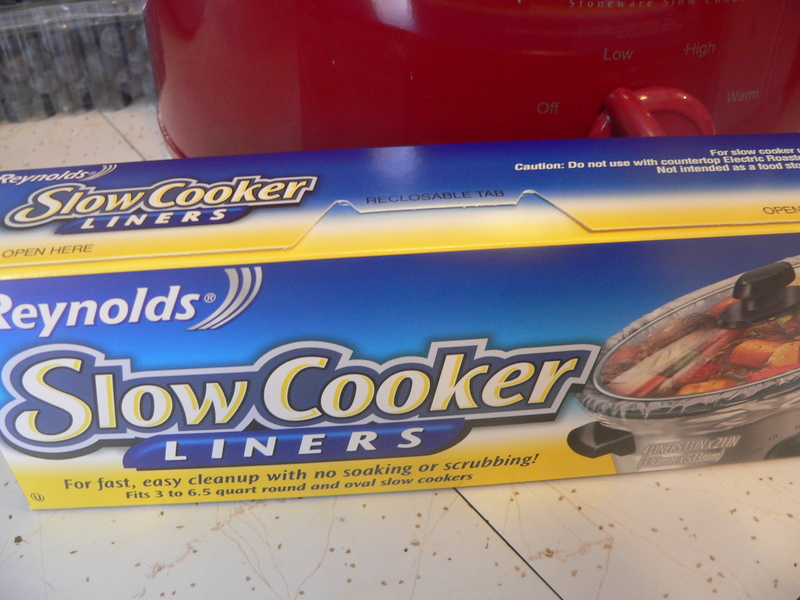 Now you can either wrap tightly and place in your freezer, or bake them right away to serve for dinner! This is a great dish to serve to a crowd! 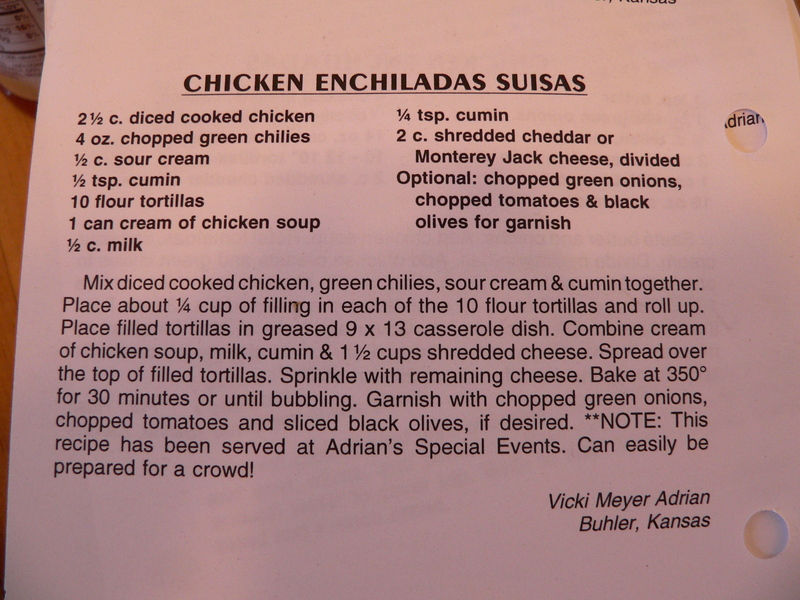 We have served these enchiladas a couple of times at Adrians during different special events. They are not too spicy, or too messy, so most everyone seems to like them. 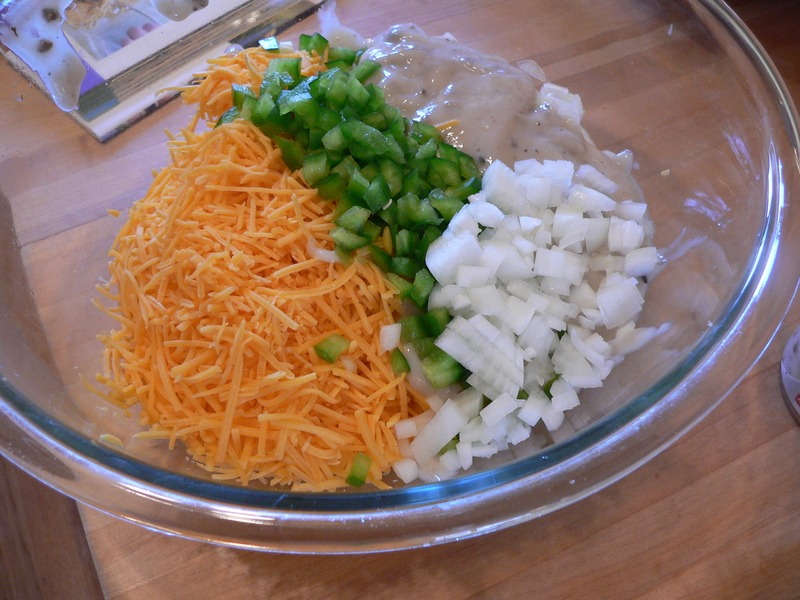 At the store, we cut these into halves or thirds because they really do make a large enchilada. Serve with some great crunchy tortilla chips, Mexican rice, a nice salad and don’t forget a little (or A LOT) of homemade guacamole on the side! The staff makes fun of me, because I always seem to have a “story” behind these recipes…”Served at my great grand-pappy’s second cousin’s funeral…etc. etc” 🙂 … Let me say that I just can’t help it! 🙂 I always tend to go to my tried & true recipes from my old, old recipe box first! 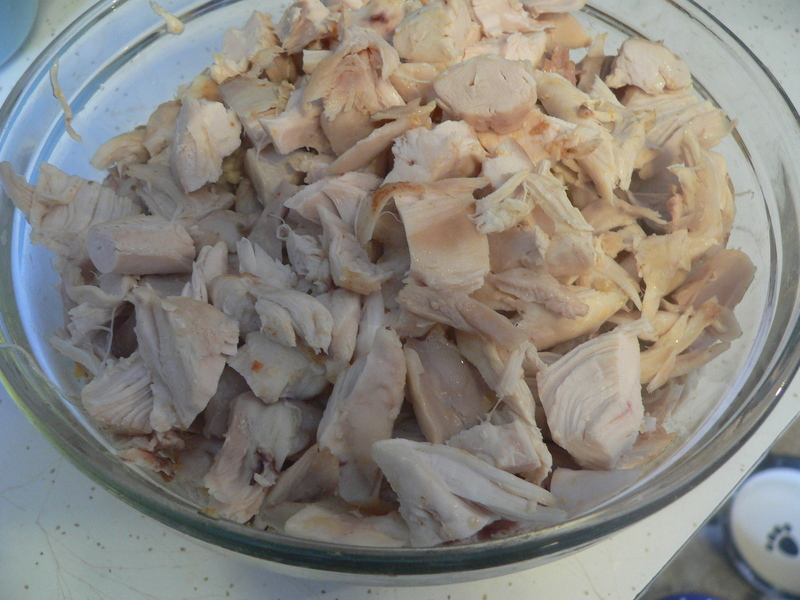 De-bone chicken and shred or chop into bite sized pieces. 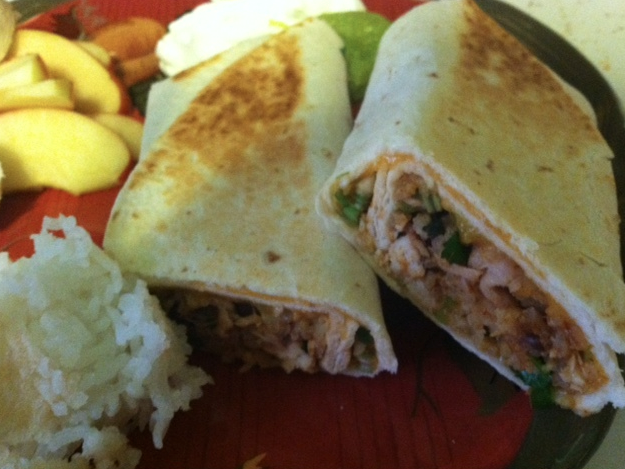 Mix cooked chicken, green chilies, sour cream and cumin together. 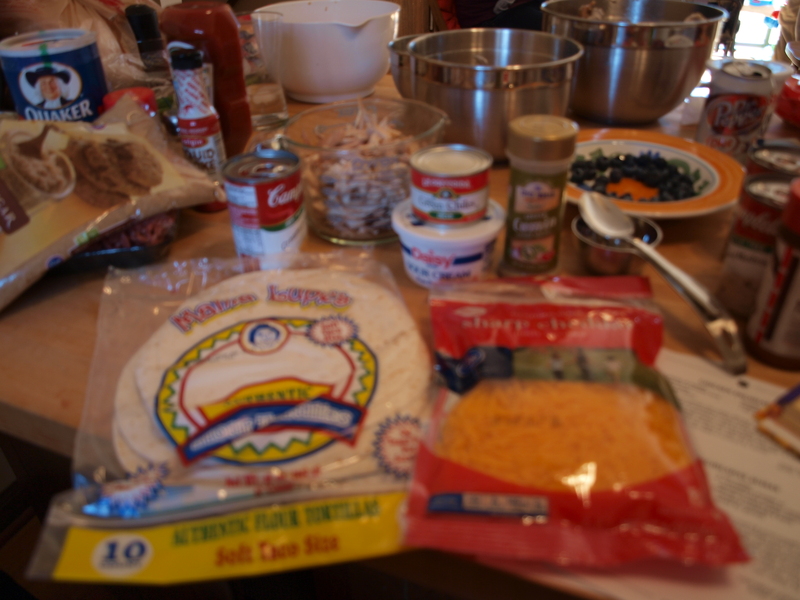 Place about 1/4 to 1/3 cup of filling in each of the 10 tortillas and roll up. Place filled tortillas in greased 9 x 13 casserole dish. Combine cream of chicken soup, milk, cumin and 1 1/2 cups shredded cheese. 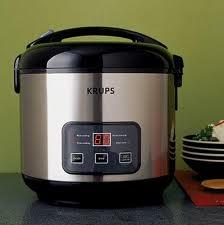 Bake at 350 degrees for 30 minutes or until bubbling. 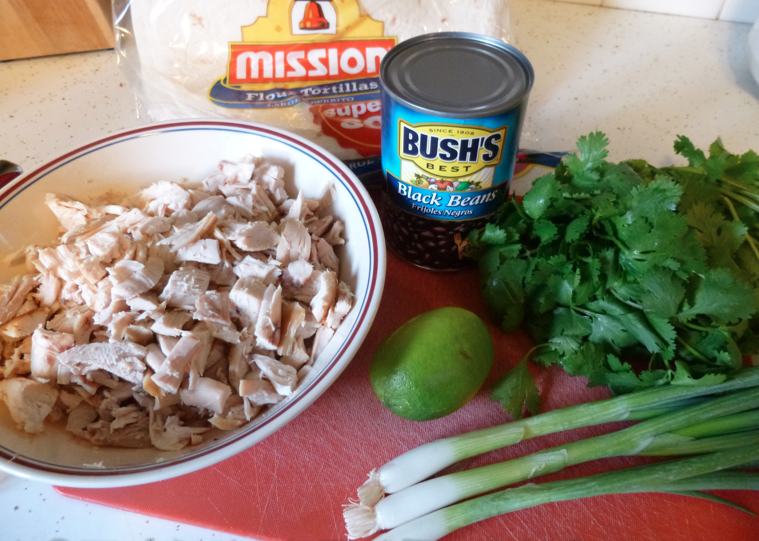 Garnish with chopped green onions, chopped tomatoes and sliced black olives if desired. 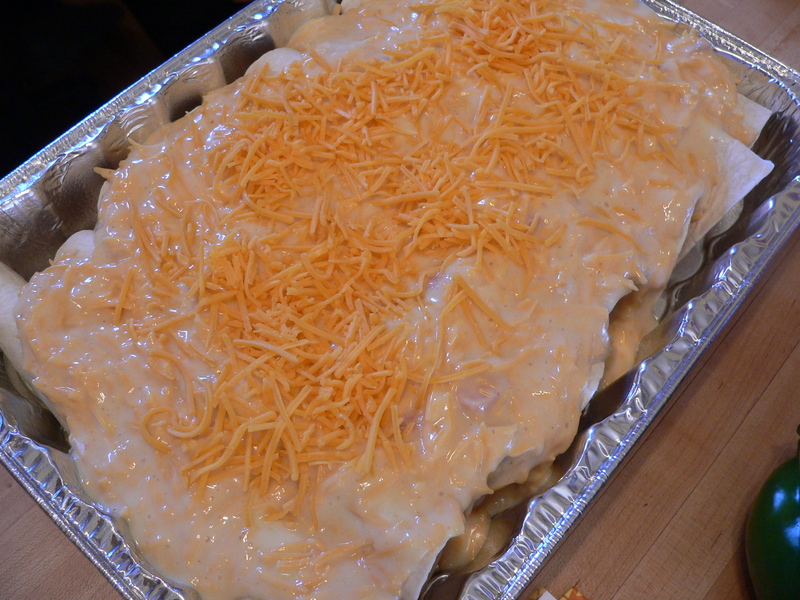 *Note: These enchiladas have been served at several Adrians events. 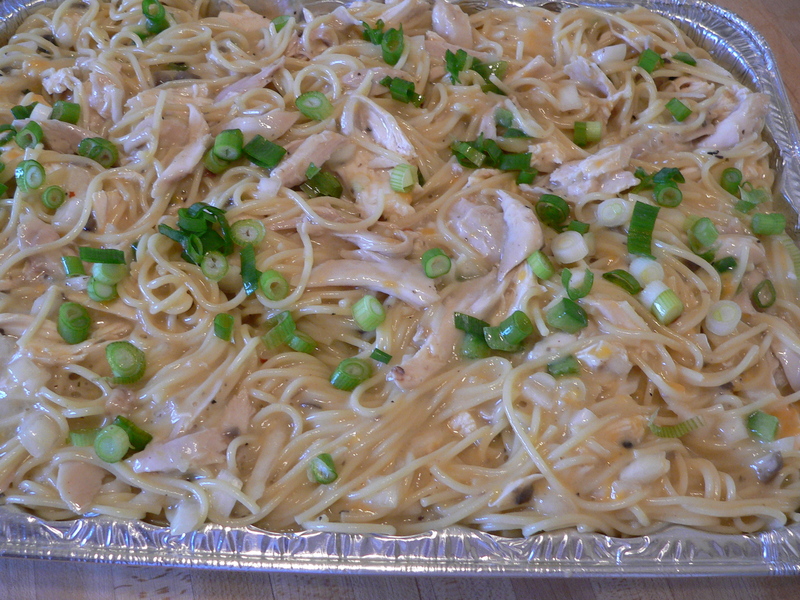 Can be easily prepared ahead and frozen for your convenience…Great for a crowd! Our daughter-in-law, Cassie has had some pretty rough health issues for the last 5 or 6 weeks, so our daughter, Jenny & I thought we could help Josh & Cassie out by filling their freezer with some delicious comfort foods. We would love to share some of these recipes with you…maybe you can use a couple of them to bless someone that is going through a difficult time. Love to have you follow along on this journey with us…and we would love to hear back from YOU with ideas of great freezer meals, or a way that you have been blessed by someone, or by how you were able to help someone with a little home cooking! We asked Cassie to make a list of their favorite comfort foods that would also do well frozen. 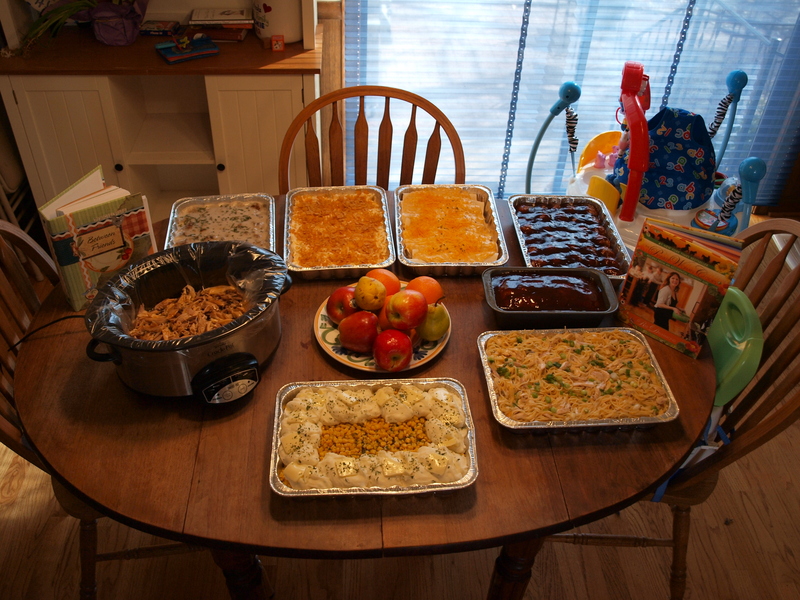 All of the recipes were found in either “The Pioneer Woman Cooks” or “Adrian’s Between Friends” Cookbooks. Here is the list we worked from: Chicken Enchiladas Suisas, Barbeque Meatballs, Meatloaf, Tahitian Chicken, Swedish Meatballs, Company Potatoes, Pioneer Woman’s Chicken Spaghetti, Shepherds Pie & Chicken Salad for sandwiches. I LOVE Ree Drummond’s “Pioneer Woman Cooks” Cookbook…the photography is incredible…the recipes are delicious and I just really enjoy her style of writing. 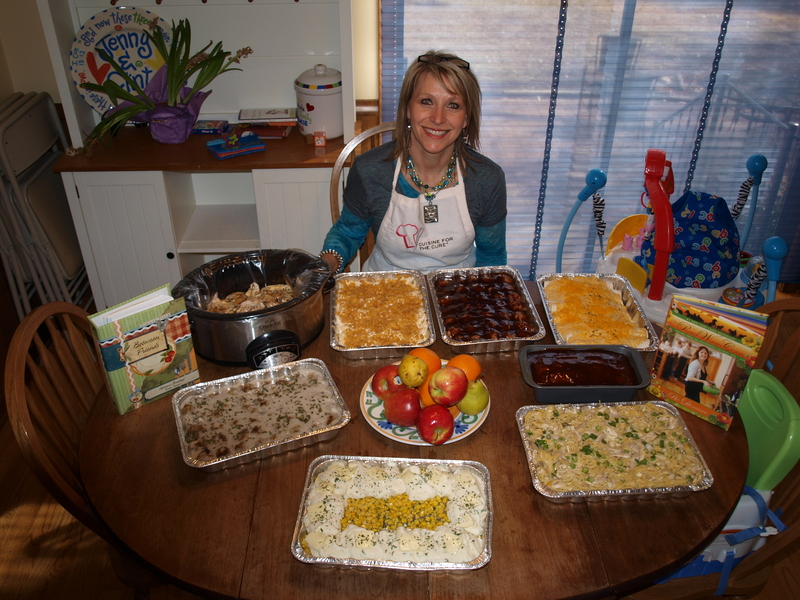 Be sure to check out her blog at The Pioneer Woman.com…I’m sure you will enjoy it as much as we do! It's easy to cook your own chicken! Start by actually cooking your own chicken. 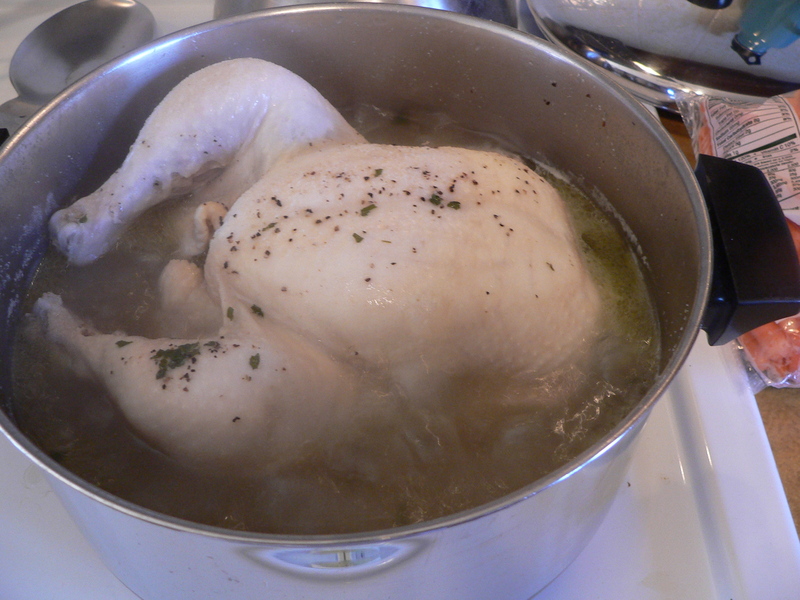 It is so easy, makes the most delicious broth, and the chicken is tender and juicy. Save this broth! We’re going to use some of it to add to our casserole, and use the rest to boil our spaghetti in for even more flavor. Start with an exceptional recipe! 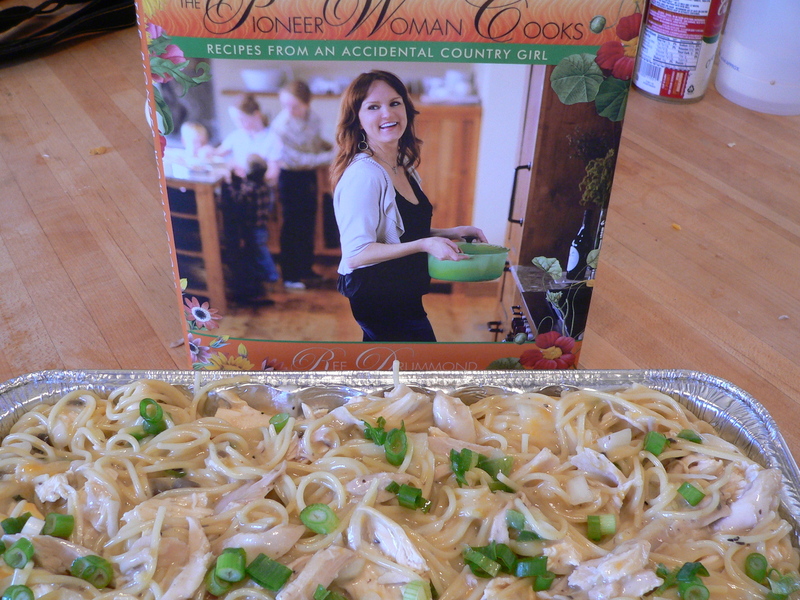 I love pictures when preparing a recipe and the Pioneer Woman Cooks has tons of them! 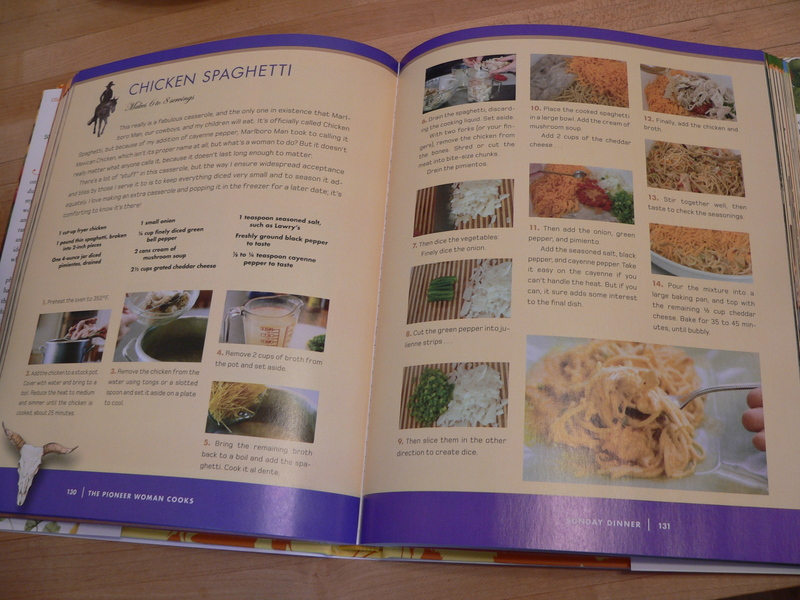 But just because a cookbook has photos, doesn’t necessarily mean that the recipe is that great. Cooking is definatly part art and part science…with a lot of love mixed in. 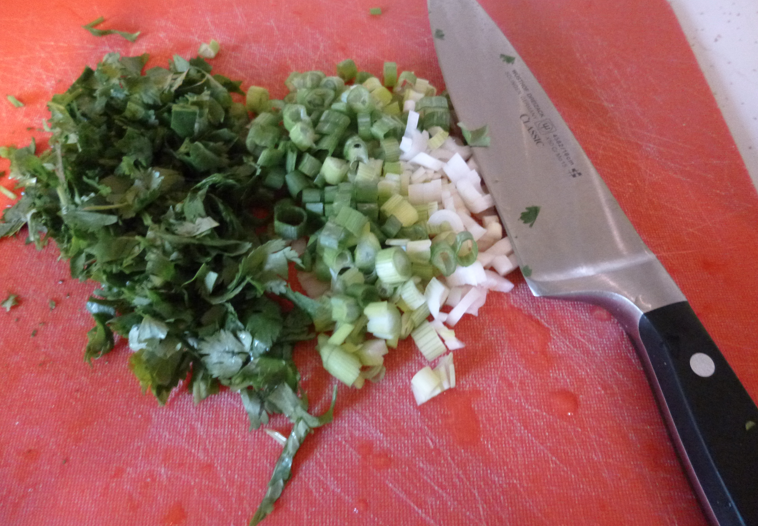 Choose very fresh ingredients for exceptional results. 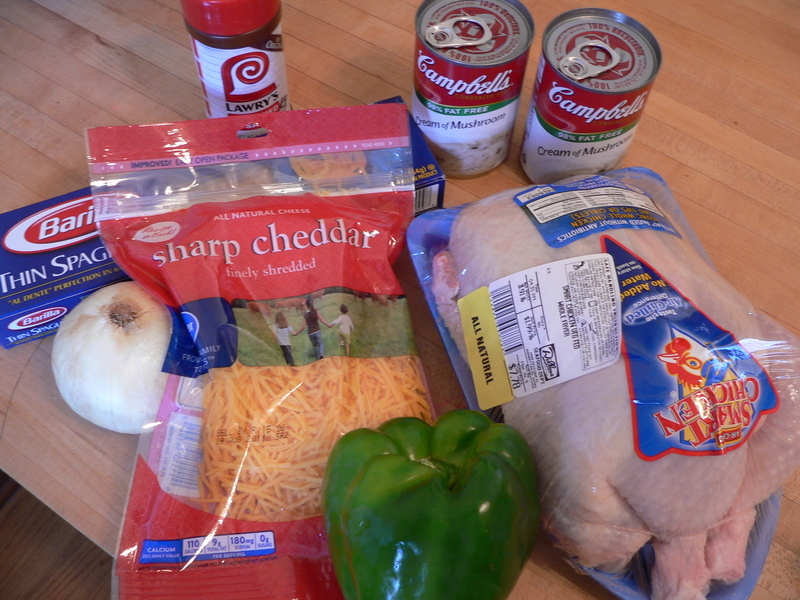 After cooking and de-boning the chicken, cook the spaghetti in the broth and set aside. Follow the recipe to put it all together (very easy), and pour the entire mixture into a 9 x 13 greased casserole. I can tell you that this recipe made plenty! The casserole was heaped when we poured it into the pan, but after several of us tasted it (and I’m pretty sure several took more than one bite) 🙂 it was ready to go into the freezer.